This Easter Egg Countdown DIY was easy to make and only cost about $3 in supplies to make. You can fill the eggs with candy or small toys. The yellow string can be purchased at a craft store for about $1. 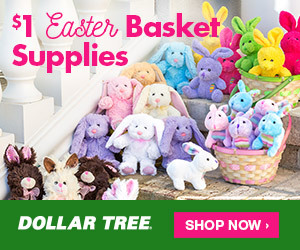 Find Easter Crafts, Supplies, and More At Dollar Tree! Also, check out my post about non-candy Easter egg fillers! To start, attach two egg picks together with tape. I wanted to use 9 eggs, but you can add more if you want! Just place the string through the holes in the top of the egg, and then tie the egg onto the egg pick. Add prizes to the eggs. We put small toys in our eggs. Then, you can number the eggs if you wish. I used a Sharpee. We hung it on the wall using string, and added this fun printable to complete our Easter Egg Countdown! My kids are looking forward to opening an egg every day as they count down to Easter. I can’t believe it’s almost time to countdown to Easter! This year is already flying by! Oh my I’m just getting ready for Valentine’s Day and Easter is around the corner. This is such a cute idea for my daughter to try this year. What an adorable craft! My kids would love making this and doing this with me! This is adorable, like an advent calendar for Easter! I love the idea of putting toys in over candy. (Easter will have enough candy, after all!) I bet small paper activities would fold up in there, too, like printed puzzles. These are really cute and so simple too. What a cute idea! I am going to make one for Easter. My son and daughter will absolutely love it!